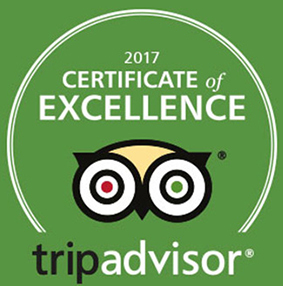 / Best Calzone in Destin FL / Freedom Friday XFINITY Racing, PGA Quicken Loans, MLB & $9.99 Ricotta|Mozzarella 2-Topping Calzone Special! 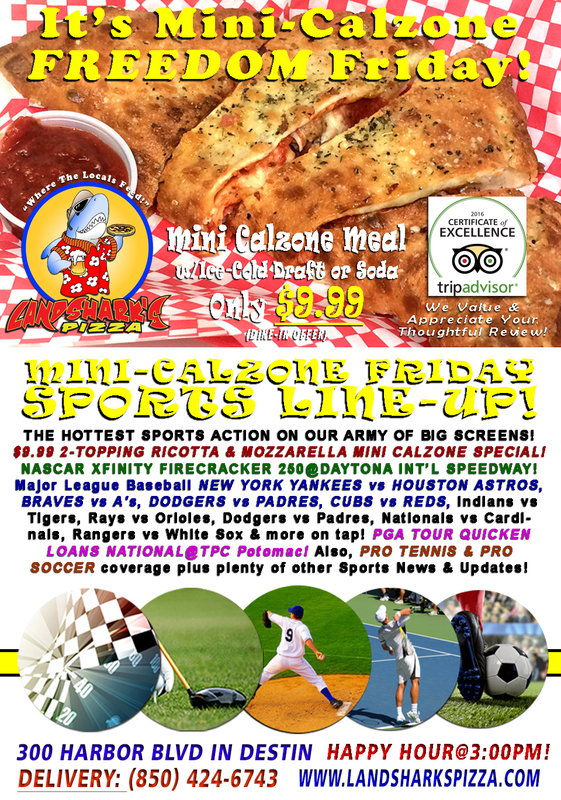 Freedom Friday XFINITY Racing, PGA Quicken Loans, MLB & $9.99 Ricotta|Mozzarella 2-Topping Calzone Special! 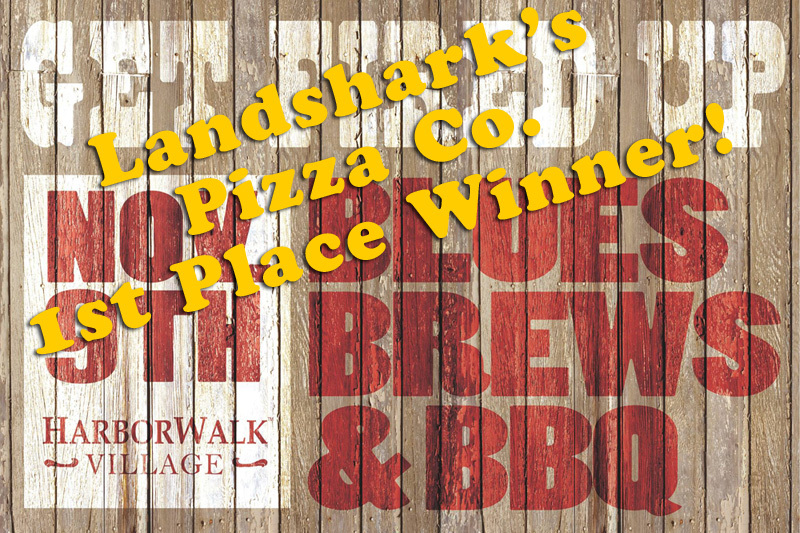 It’s time to ring the bell and get crackin’ on a great weekend with a 2-TOPPING RICOTTA & MOZZARELLA MONSTER MINI-CALZONE with an ICE COLD DRAFT or Soft Drink only $9.99 dine-in special plus lots of great sports tv, great company, and a full bar! 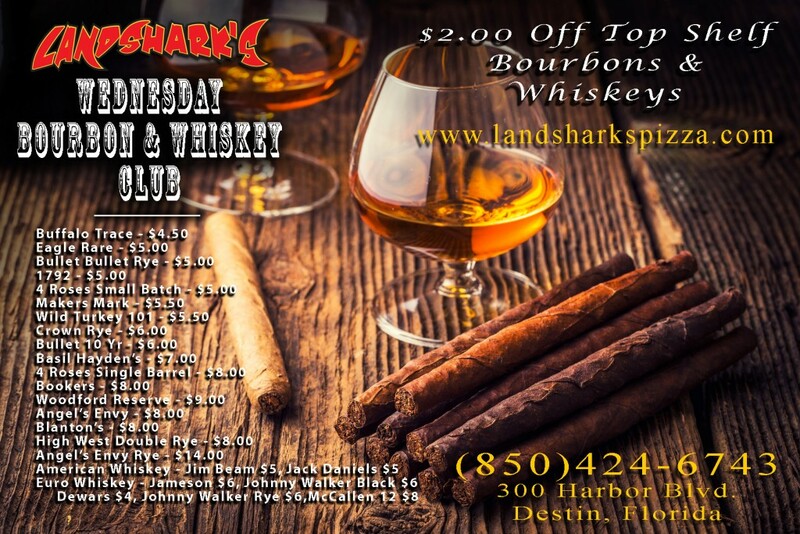 LANDSHARK’S DRINK OF THE DAY – $1.00 (One whole greenback) OFF our delicious ‘JOHN DALY’ Cocktail – Tee it up at the bar and sip your way to victory as you check out exciting sports, eat good food, and sip away! SPORTS ON OUR ARMY OF BIG SCREENS – NASCAR FIRECRACKER 250 Xfinity Racing@Daytona International Speedway! 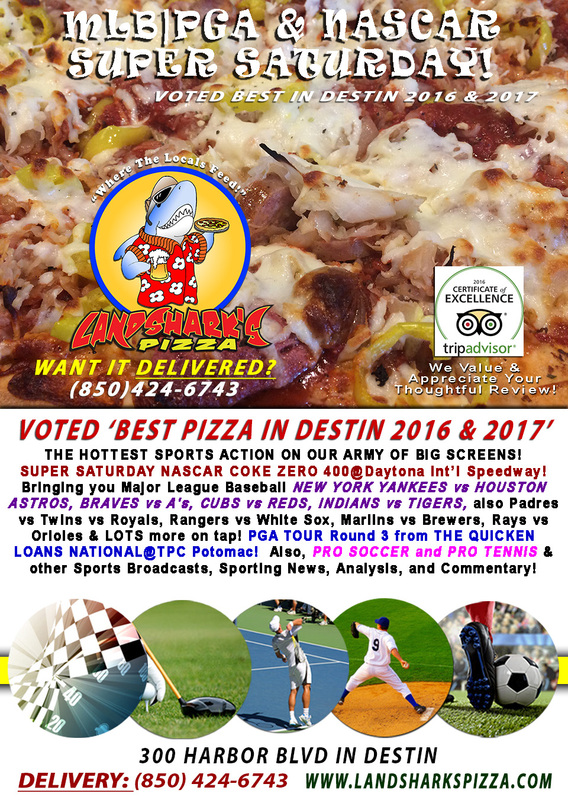 Major League Baseball featuring NEW YORK YANKEES vs HOUSTON ASTROS, BRAVES vs A’s, DODGERS vs PADRES, CUBS vs REDS, Indians vs Tigers, Rays vs Orioles, Dodgers vs Padres, Nationals vs Cardinals, Rangers vs White Sox & LOTS more on tap! PGA Tour 2nd Round QUICKEN LOANS NATIONAL@TPC Potomac, MD! Also, PRO TENNIS & PRO SOCCER coverage plus plenty of other Sports Broadcasts, Sporting News, Analysis, and Commentary! NASCAR This Week: (Saturday July 1st) Monster Energy Cup Coke Zero 400@Daytona. 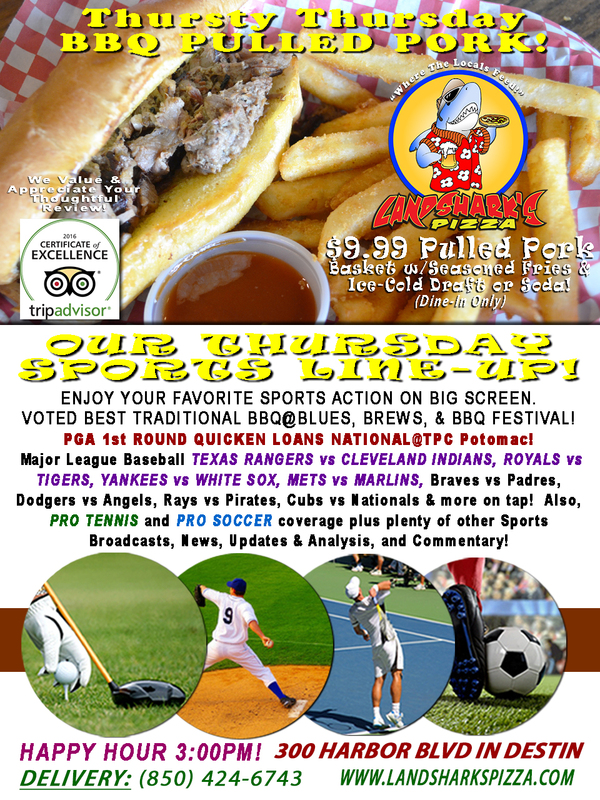 Previous Post: « Thursty Thursday BBQ & Brew BEST TRADITIONAL BBQ with FRIES & DRAFT or Soda only $9.99|MLB, PGA & More!